Tarquinia is een stadje in de Italiaanse provincie Viterbo. Het heeft een goed bewaarde binnenstad, met kerken uit de 13de en paleizen uit de 13de en 15de eeuw, een castello, en een belangrijk archeologisch museum. 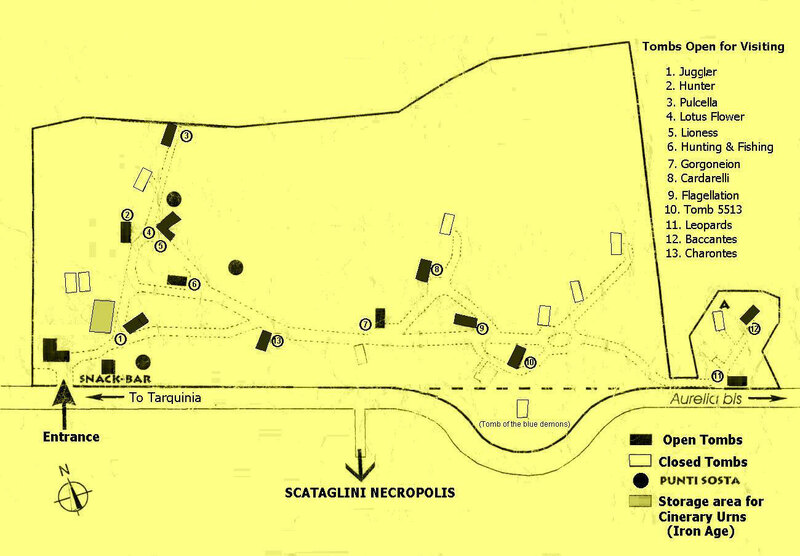 Maar Tarquinia is vooral bekend voor zijn necropolis, die deel uitmaakt van de werelderfgoedlijst van de Unesco. 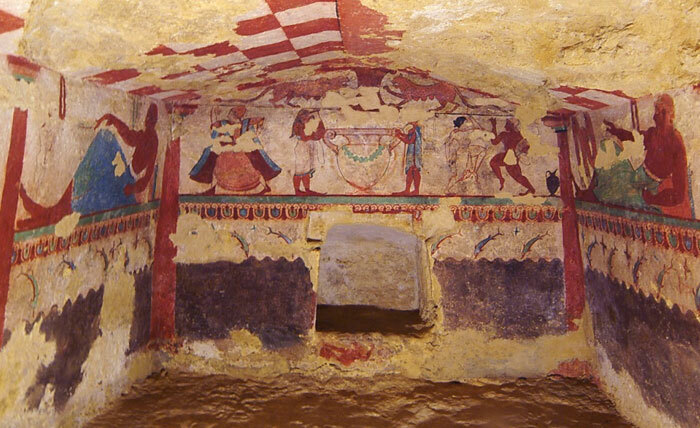 De Etruskische necropolis omvat 6000 graven, waarvan 200 beschilderd zijn met schitterende fresco’ s. De necropolis van Tarquinia is omwille van de vele fresco's van uitzonderlijk belang voor onze kennis van het dagelijks leven van de rijke klasse in de Etruskische maatschappij. De belangrijkste site is de necropolis van Monterozzi. het Palazzo Vitelleschi (15e eeuw), waarin nu het Nationaal Museum van Tarquinia is gehuisvest, met als blikvanger het reliëf in terracotta met twee gevleugelde paarden uit de 4e eeuw v.o.t.. 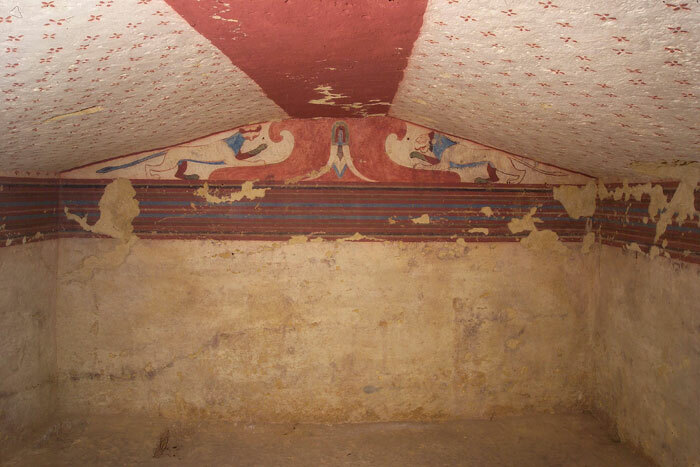 The archaeology of Tarquinia has been at the forefront of Etruscan studies since the early days of antiquarian scholarship and is renowned for its unique painted tombs and vast cemeteries, and attracted eminent writers and poets, among them Stendhal, D.H. Lawrence, Aldous Huxley and Malaparte. 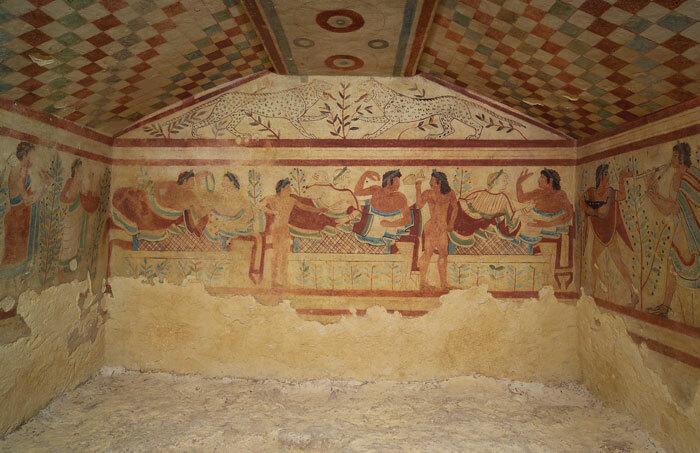 Among the famous writers drawn to Tarquinia's enigmatic Etruscan past, its legends, and cultural heritage were Stendhal, D.H. Lawrence, Aldous Huxley and Malaparte. Henri Bleyle Stendhal, the great 19th-century French novelist who penned The Red and the Black, was for a time a diplomat in Rome. 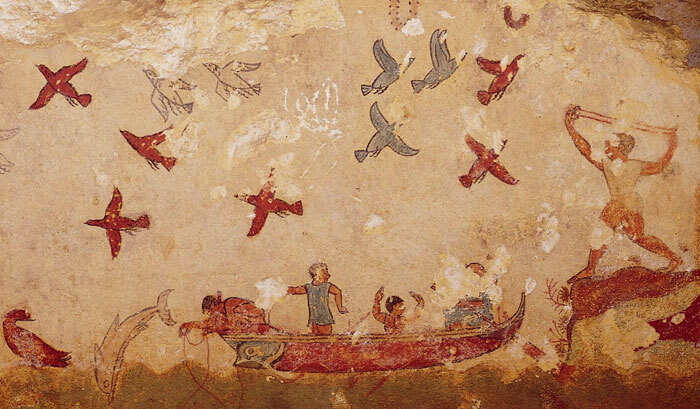 He became enchanted with Tarquinia, then known as Corneto, and authored a long article about its recently discovered Etruscan tombs. In early April 1927 D.H. Lawrence embarked on what was to be his last extended walking tour. Accompanied by his friend Earl Brewster, he visited the major sites associated with the Etruscans, from Volterra in the north of Tuscany to Tarquinia. 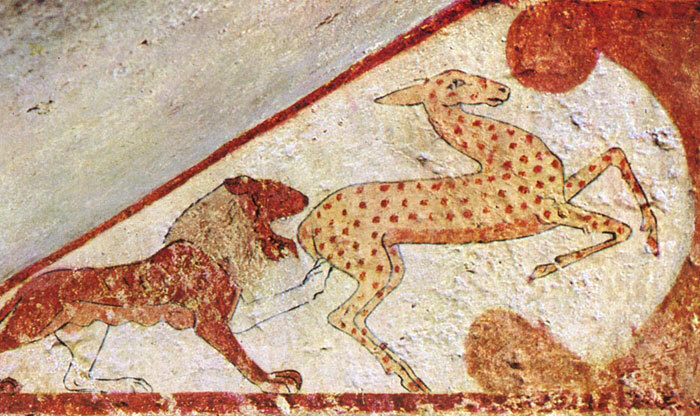 The Tomb of the Leopards is a charming, cosy little room, and the paintings on the walls have not been so very much damaged. All the tombs are ruined to some degree by weather and vulgar vandalism, having been left and neglected like common holes, when they had. been broken open again and rifled to the last gasp. But still the paintings are fresh and alive: the ochre-reds and blacks and blues and blue-greens are curiously alive and har-monious on the creamy yellow walls. Most of the tomb walls have had a thin coat of stucco, but it is of the same paste as the living rock,. which is fine and yellow, and weathers to a lovely., creamy gold, a beautiful colour for a background. The walls, of this little tomb are a dance of real delight. The room seems inhabited still by Etruscans of the sixth century before Christ, a vivid, life-accepting people, who must have lived with real fullness. On come the dancers and the music-players, moving in a broad frieze towards the front wall of the tomb, the wall facing us as we enter from the dark stairs, and where the banquet is going on in all its glory. Above the banquet, in the gable angle, are the two spotted leopards, heraldically facing each other across a little tree. And the ceiling of rock has chequered slopes of red and black and yellow and blue squares, with a roof-beam. painted, with coloured, circles, dark red and blue and yellow. So that all is colour, and we do not seem to be underground at all, but in some gay chamber of the past. The dancers on the right wall move with a strange, powerful alertness onwards. The men are dressed only in a loose coloured scarf, or in the gay handsome chiamys draped as a mantle. The subulo plays the double flute the Etruscans loved so much, touching the stops with big, exaggerated hands, the man behind him touches the seven-stringed lyre, the man in front turns round and signals with his left hand, holding a big wine-bowl in his right. And so they move on, on their long; sandalled feet, past the little berried olive trees, swiftly going with their limbs full of life, full of life to the tips. 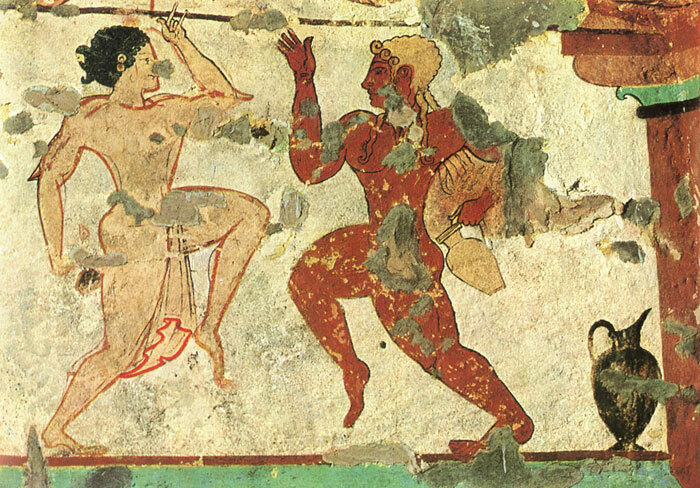 This sense of vigorous, strong-bodied liveliness is charac-teristic of the Etruscans, and is somehow beyond art. 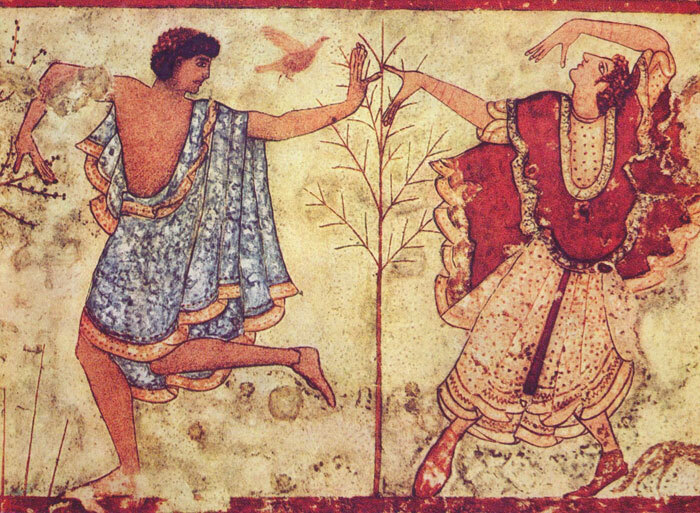 You cannot think of art, but only of life itself, as if this were the very life of the Etruscans, dancing in their coloured wraps with massive yet exuberant naked limbs, ruddy from the air and the sea-light, dancing and fluting along through the olive trees, out in the fresh day. The end wall has a splendid banqueting scene. The feasters recline upon a checked or tartan couch-cover, on the banquet-ing couch, and in the open air, for they have little trees behind them. The six feasters are bold and full of life like the dancers, but they are strong, they keep their life so beautifully and richly inside themselves, theyare not loose, they don't lose themselves even in their wild moments. They lie in pairs, man and woman, reclining equally on the couch, curiously friendly. The two end women are called hetaerae, courtesans;. chiefly because they have yellow hair, which seems to have: been a favourite feature in a woman of pleasure. The men are dark and ruddy,and naked to the waist. The women, sketched on the creamy rock, are fair, and wear thin gowns, with rich mantles round their hips. . They have a certain free bold look, and perhaps really are courtesans. The man at the end is holding up, between thumb and forefinger, an egg, showing it to the yellow-haired woman who reclines next to him, she who is putting out her left hand as if to touch his breast. He, in his right hand, holds a large wine-dish, for the revel. The next couple, man and fair-haired woman, are looking round and making the salute with the right hand curved over, in the usual Etruscan gesture It seems as if they too are saluting the mysterious egg held up by the man at the end who is, no doubt, the man who has died, and whose feast is being celebrated. But. 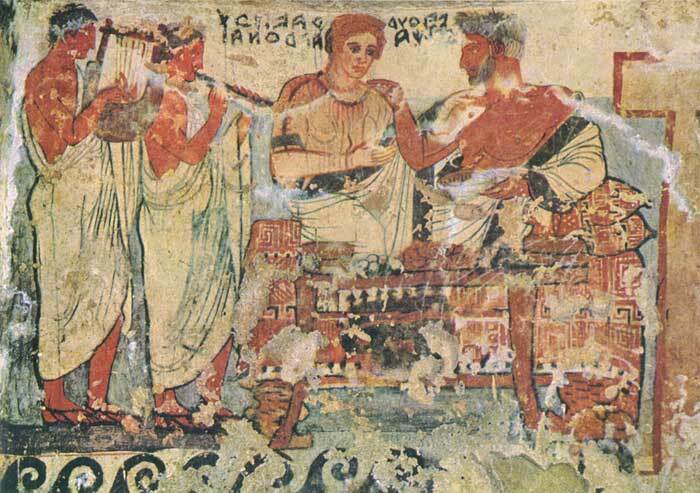 in front of the second couple a: naked slave with a chaplet on his head is brandishing an empty winc jug, as if to say he is fetching more wine. Another slave farther down is holding out a curious thing like a little axe, or fan. The last two feasters are rather damaged. One of them is holding up a garland to the other but not putting it over his head as they still put a garland over your head in India, to honour you. Above the banqueters, in the gable angle, the two great. spotted male leopards hang out their tongues and face each other heraldically, lifting a paw, on either side of a little tree.. They are the leopards or panthers of the underworld Bacchus, guarding the exits and the entrances of the passion of life. There is a. mystery and a portentousness in the simple scenes which go deeper than commonplace life.. It seems all so gay and light Yet there is a certain weight or depth of significance that goes beyond aesthetic beauty. Toscane is een van de meest spectaculaire streken in Italië. Hier ligt is de bakermat van de Italiaanse Renaissance. In de prachtige heuvels van de Toscaanse Maremma, gelegen ten noorden van Tarquinia, ligt de idyllische vakantiehuis Santa Pia, waar gasten van over de hele wereld kunnen meegenieten van het echte Italiaanse leven, la dolce vita Italiana. Etruskische plaatsen zoals Pitigliano, Sorano, Sovana en Saturnia liggen niet ver weg, en kunnen op weg naar Tarquin ia bezocht worden.